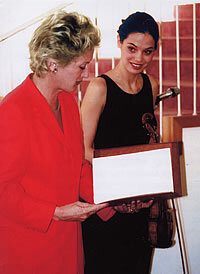 Alois Kottmann Prize for classical, cantando violin playing presented in conjunction with the City of Frankfurt am Main. The original impetus for wanting to play the violin is a desire to sing and to move rhythmically. The aim of the Prize is to promote "classical" discipline and to support a singing quality of tone which distinguishes and characterises the player's personality. There is no age limit to the competition; its prime focus is on people and on culture. The Kottmann Prize is aimed at promoting the Frankfurt Carl Flesch tradition whose greatest proponents were Alma Moodie in Frankfurt and, further afield in Europe, Max Rostal. The main accent lies on exploration on an artistic and stylistic level.